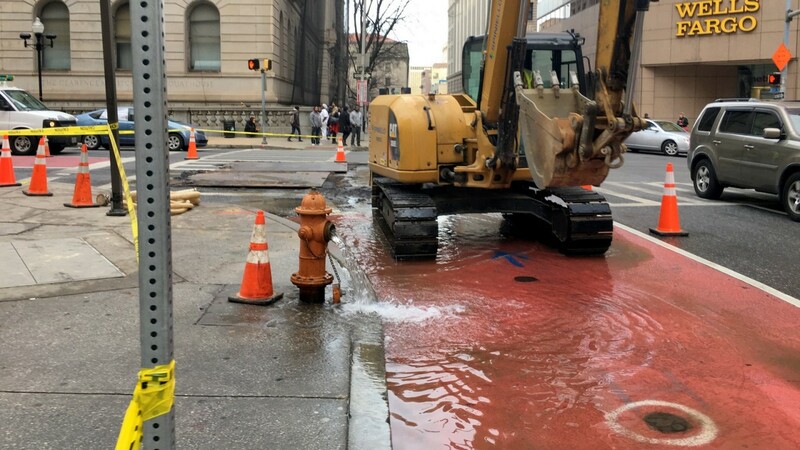 Late afternoon banter in the file room at Baltimore’s Mitchell Courthouse turned to whoops of joy from staffers today, as word spread that the building was being evacuated due to a water main break. “Shut everything down – we got a water main break!” a woman announced to co-workers at about 3:40 p.m. Employees gathered their things and headed for the door. Outside the building, at Fayette and St. Paul streets, water was flowing from an open hydrant and pooling in the street. Workers from Spiniello Companies, Baltimore’s primary emergency sewer and water contractor, hauled equipment to a deep hole that had just been dug in the street. 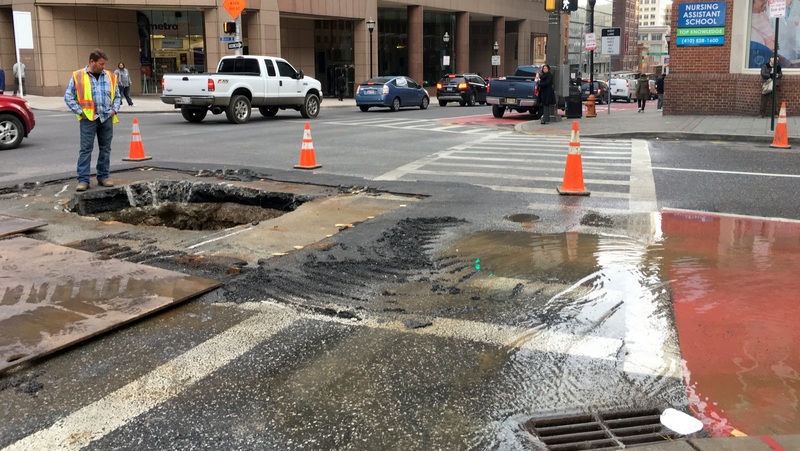 The city had known about the break “for a while,” said Jeffrey Raymond, spokesman for the Department of Public Works, explaining that it is centered at 6 St. Paul Street, the William Donald Schaefer Tower, that houses state offices. If workers can make repairs in time, the Courthouse and other buildings in the multi-block affected area should have their water service restored by tomorrow, Raymond said. Subfreezing temperatures in recent weeks have caused more than 100 broken water mains across Baltimore and Baltimore County. Raymond said crews are continuing to work on the breaks – and still have 36 to repair.